Expectations and excitement has been building up for some time, as the number of canary-yellow jerseys take to the streets in greater numbers by the day. Flags everywhere, pavements chalked up in creative green, yellow and blue designs, peoples smiling in anticipation of the sixth World Cup title destined for the country where football is considered part of the DNA. In 2014, World Cup in Brazil can be resumed as one, resigned, collective sigh. Yes, resigned, because Brazil has had SEVEN years to prepare for what was supposed to be the party of parties, the event of events, the celebration of celebrations. Of Brazil showcasing all its social, civic and economic progress, its joyeux de vivre, its welcoming ways and, of course, superior football. Well, Brazil is certainly a favourite to lift the trophy, so there might be glimpses of superiority on the pitch. Forget the rest. At the moment of writing, kickoff is less than two days away. Preparations for hosting the 2014 World Cup has been Brazil in a nutshell: a striking incapability to plan, to execute, to conduct with transparency. Considerably less than half of promised infrastructure improvements have been concluded. Some probably never will be – which is far worse than all those aborted before any physical labour begun – as it’s literarily money down the drain. However which way you look at it, costs have soared, and corruption is taking its toll. Behold the Mané Garrincha stadium in the capital of the country, originally budgeted at around 800 million reais (US$ 350 million), but today almost hitting the 2 billion (US$ 900 million) mark. Or the Itaqueirão stadium, where the opening game will be held, situated in one of the poorer outskirts of the city of São Paulo. The amount of public money poured into these and other stadiums around Brazil… A stark contrast to the “World Cup of Private Investments” enthusiastically proclaimed by President Dilma Rousseff a few years back. True enough, the relationship Brazilians nourish to football has gone rather sour over the last decade or so. How could it not? With access to information increasing by the day, especially the young are increasingly turning their backs on the corrupt and inefficient Brazilian Football Federation, the poorly run football clubs, the badly kept stadiums, the overpriced tickets, the insane hours imposed by leading broadcaster Globo, the arbitrary rulings of the Superior Tribunal of Sports… Oh, and I almost forgot to mention the questionable quality of Brazilian football itself. So, yes: football in Brazil is not what it used to be – not on club level, not on National Squad level. Still, that’s only part of the explanation, and a minor part. You see, Brazil is, still, a football nation. Thing is, not only World Cup preparations but the whole of Brazil has gone awry. The economy has entered into a general stalemate, suffering under notoriously heavy bureaucracy, lack of fiscal reforms and a desperate need for investments in infrastructure. Tens of millions have been lifted out of extreme poverty due to social welfare programs and grants, while also the lower middle class has been growing considerably in numbers. Making up the lion’s part of Brazilian society, these people struggle immensely to make ends meet, and increasingly so as inflation is again moving up the scales, bringing back ghosts past. Elections are due this fall, but when you examine the candidates, there’s little hope in sight. Brazilians are tired. Frustrated. Angry. They would love to celebrate the World Cup, but many lack the energy. And even larger numbers seem torn between mixed feelings. To what extent can I enjoy the World Cup without giving the government my stamp of approval? By having fun, am I being a fool, pathetically duped into submission? Perhaps we’ll have a World Cup without major incidents. Brazil showing the world “they can do it”. Backslapping all around. And then refocus: after all, we have presidential elections coming up, then the 2016 Olympics in Rio de Janeiro. Perhaps we’ll have protests, and protests escalating into what we saw in mid 2013, with – literally – millions of people taking to the streets, jeopardising the entire World Cup. Protests that would show governments and FIFA that PEOPLE is a force to reckon with. In a broader perspective, I have a feeling the second image of Brazil would be so much more enriching for the country, and for the world. ps. I’d really welcome your thoughts on this post; feel more than free to leave your comments. Previous Palmeiras player makes it into the Brazil World Cup squad! * The economic growth, based only on the rise of the price of commodities, already slowed down (to only 1-2% per year: a ridiculous number). * The people moved away from poverty because of the increasing public expenditure (that probably will continue growing, even if the GDP don’t follow) and some doubtful change of the methodologic (the income for being classified as middle class falled, but the consumption itens typical of that class didn’t). The impression I have is that most of the Brazil’s “boom” was simply a make up. And it’s going off on the worst time possible: when all the world will watch. The fear of some to become a new Venezuela are, unfortunely, well-backed. Thanks for your thoughtful comments, Gustavo. Readers, do like Gustavo, keep’em coming. I’m really keen to hear your ideas about this duality of feelings regarding the World Cup. Charles, I agree that a nice and successfully conducted event would be good. In the short term. But it would also reinforce the status quo in Brazil, and all the social reforms so badly needed. Brazil, and especially Brazilian politicians, only work under pressure. I’d go further: Brazilian politicians only perform when in fear. It was incredible how much work they got done during the week of peaking mass protests last year. Fear drove them. And I believe we might have to head in that direction again. Time will tell. Anyway, let’s hope all goes well, whatever that means in the end. Welcome back always, Charles! Well, I haven’t realized this duality of feelings, even though it’s exactly what I feel. 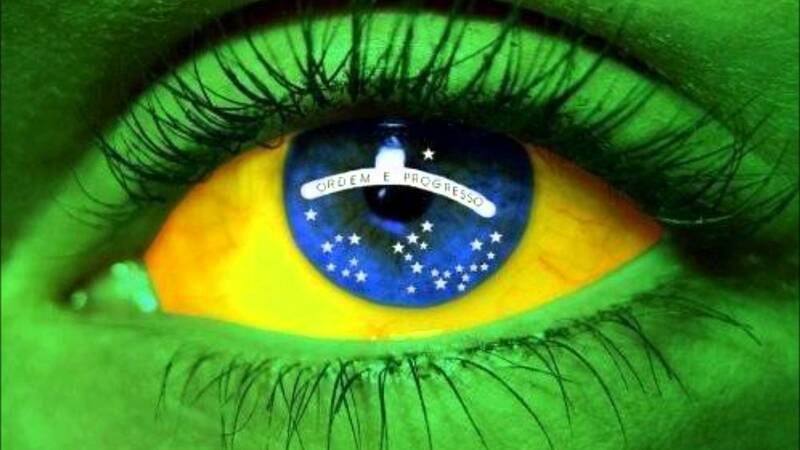 Brazilian people are not conscious enough to realize all the dirty game played by FIFA and CBF. Changing it is a long term goal. In the other hand we do have a great event that is able to join different cultures and people here, in our country. It’s amazing! I really don’t know what’s going to happen, but I wouldn’t like to see major problems. The fest must be respected, and once it’s finished, we can demand explanations from FIFA, the government, and whatnot. Have a nice World Cup, everybody! Bruno, in my opinion, FIFA and CBF are crooks, have always been. But at least, they don’t spend our money. They make money out of us, but they don’t spend ours. Like the Brazilian government has done. And spent badly. I hope you’re right: that we have a great World Cup and massive demands for change as soon as the spectacle is over. Government and politicians mustn’t be allowed to get away with this. Cheers! And along those lines, Alexandre, I hope Brazil wins the World Cup, eliminating any chance for people to say “these new protests are childish and driven by frustration due to the seleção’s poor performance”.